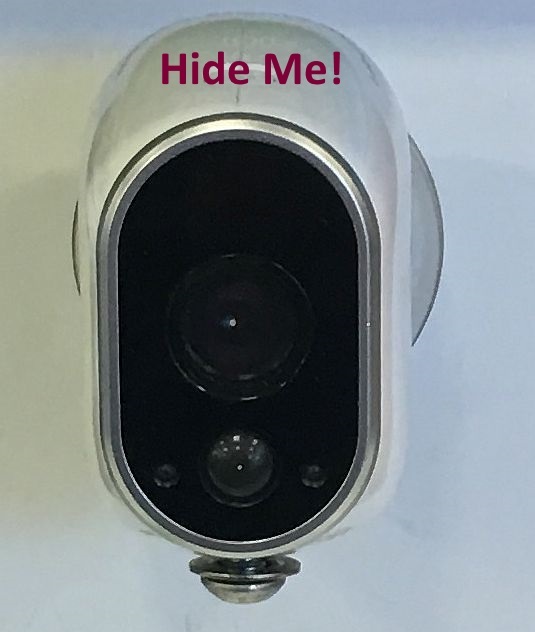 Today, we’re going to give you some ideas on how to hide an Arlo Smart Home Security Camera, Arlo Pro HD Home Security Camera or Arlo Pro 2. These cameras are similar in design so the concepts can be equally applied to both camera models. Why would you want to do that? You don’t want any bad guys to see it! In this article, we will look at a few places and methods to hide an Arlo Smart Home Security Camera. The magnetic dome that comes with the Arlo camera doesn’t lend itself to making it easy to hide the camera. These mounts are typically used in elevated situations. Usually for locations that are six feet or more off the ground. To hide an Arlo Smart Home Security Camera, you will need to lose the dome mount. We will be using the Arlo camera as a tabletop camera. In other words, no mount. The night vision IR lights can be seen in the dark. This presents a dilemma in terms of keeping the camera stealth at night. If using these for catching an intruder, it’s probably best to keep night vision activated. If using these for other purposes, consider turning this feature off as the camera can be seen with the IR lights on. Secondly, there is a low battery indicator on the front of the camera that will blink periodically when the batteries are low. Turn that off or place a small strip of Duct Tape over it. Now let’s look at some clever ways to hide an Arlo Smart Home Security Camera. The Arlo cameras have a nice wide 110 degree lens. It’s made to see most of the room from a corner shelf. Keep the camera on a corner shelf with a bunch of keepsakes surrounding it. It’s hard to see it. Especially if you have that status indicator covered and don’t use the night vision. I find that placing it away from a counter or table where it is out of the open is the first step in hiding a camera. Fake plants make for good camouflage. Plant your camera inside a fake plant. Be sure the leaves do not get in the way of the wide angle lens. Everybody has a fake plant, so try this method out. Speaking of camouflage, that white camera can stick out like a neon sign screaming “Look at my security camera”. Consider the Wasserstein Silicone Skins for Arlo Pro. These fit around the camera and there’s different colors available. These are great for helping your camera to blend in with the surroundings better. One of our favorite ways to hide any small camera is inside a tissue box. The Arlo camera is a small one. I like using a tall box of Kleenex tissues. Remove all the tissues. Cut a small hole to line up with the camera lens placement. Put the Arlo Smart Home Security Camera in the box, use some tape to keep it in place. Put the tissues back in the box. A tissue box with an elaborate design is going to mask the little hole fairly effectively. Most have one of these boxes of Kleenex tissues in their home already. So more than likely, it’s a free hiding place. The primary idea behind a home security camera is to catch someone in the act so that you can hopefully stop them or at least catch them. Using these idea to hide an Arlo Smart Home Security Camera should help you to do that.